All over Africa, traditional healers and their ancient knowledge of nature and spirituality are disappearing fast. 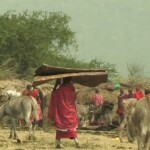 Spirits of Africa is a series of short documentaries that records and preserves their wisdom. This is a project by writer and film maker Ton van der Lee who lived in Africa for many years. All copyrights belong to him.